The annual meeting of the USS STEINAKER Reunion Association was held on the 22nd of April 2017 in Nashville, TN with 120 shipmates and ladies present. Meeting called to order by the Chairman, John Evans. Elected officers present were John Evans, Vice Chairman, Jimmy Bunch and Secretary/Treasurer Kenneth Kohnen. Advisor present was Russ Noble. Chairman John Evans welcomed shipmates and noted the large attendance for the 2017 business meeting. The minutes were accepted as published in the annual newsletter. Received and approved the report of the Secretary/Treasurer. There was no further unfinished business. The Chairman moved to new business. The election of officers was held. Frank Price was nominated and elected as Chairman; Robert Ward was nominated and elected as Vice Chairman. Kenneth Kohnen was nominated and elected as Secretary/Treasurer. Frank Price made a motion to create a Board of Directors consisting of John Evans, Jimmy Bunch, Bill Combs, Russ Noble to maintain oversight and authority over the association and to include current Officers consisting of Frank Price (Chairman), Robert Ward (Vice Chairman), and Ken Kohnen (Secretary/Treasurer). A vote was taken and unanimously approved. Association unanimously approved giving a $100.00 VISA Gift card to John Evans, Jimmy Bunch and Russ Noble for all their hard work over the last 25 years. Russ Noble presented a t-shirt to Doc Evans and Jimmy Bunch with Navy Brothers on the back. On behalf of the Association Robert Ward presented jackets to Doc Evans and Jimmy Bunch as retirement gifts. Bob Johannesen gave each shipmate a souvenir coin. Chairman, John Evans discussed plans for the 2018 STEINAKER Reunion. Discussion about Baltimore, MD by Frank Price; Washington, DC by Bob Wright; Charleston, SC by John Evans; Branson, MO by John Evans; and Virginia Beach, VA by John Evans and mentioned the dates would be 26-29 April 2018 as 1st choice and 19-22 April 2018 as an alternative choice. Members present voted to hold the 2018 STEINAKER Reunion in Virginia Beach, VA. The reunion dates of 26-29 April 2018 were approved. Discussion was held on going to museums, shows, tours and other events that didn’t require a lot of climbing such as touring on board a ship. Historical sites were strongly suggested. Members present voted to have the 2019 STEINAKER Reunion held in either Savannah, GA or Gettysburg, PA. The Thursday night “Welcome Aboard Reception” was sponsored by Sally Cascini in honor of Frank Cascini. Harry & Ruth Hodum graciously sponsored the luncheon after the tour. Frank Furtado sponsored the bus tours. Bill Grayson in memory of Mary Lou Grason along with the Steinaker Association sponsored the Banquet. A heartfelt thanks to all for their generous donations and support of the Steinaker Association. Discussion was held concerning donations. A motion was made by shipmates to donate to the following organizations: Tin Can Sailor’s, Inc. $500.00, USS Joseph P. Kennedy, Jr. Association $500.00 (designated for getting Steinaker parts from storage), Navy Relief of Pensacola $250.00, USS Orleck Naval Museum $125.00 and the USS Turner Joy Museum Ship $125.00. We also made a $500.00 donation to PNP Ladies Auxiliary FRA for the Carolyn Combs scholarship last year. Banners were presented to the following shipmates for their years of supporting the STEINAKER Reunion Association: Al Lawler; Jodie Sanders; Jerry Johnson; and Denny Jenkins. Thanks much! Drawing of Free Room nights at the Guesthouse Inns & Suites. Winners were: Ron Rutkofske; Lynne Thoreson; John Woynicz; and Robert Wright. Congratulations! Discussion was held about the Saturday night auction, the silent auction, and the 50/50 drawing. The formal business meeting was adjourned. After a five-minute break shipmates gathered for introductions and acknowledgements by STEINAKER shipmates. There being no further business the 2017 Annual Meeting of the USS STEINAKER Reunion Association adjourned until 2018. Presentations by CAPT Lawler's Daughter, CAPT Evie Quattrone and her friend COL Bo Schauer, on their jobs working with the Afgan people while stationed in Afghanistan recently. All members enjoyed their interesting discussions of their roles in that conflict. Secretary/Treasurer Ken Kohnen made mention of the shipmates who sent dues/donations in support of our shipmates but were unable to attend for various reasons: Don Bair, Alan Brown, Dale Dilling, Jeffrey Duvlea, John Fadely, John Fochtman, Paul Heiland, Tom Hutt, Anthony Jack, Harvey Johnson, Donald Laferriere, Charles Lehr Jr., William McCormick, Robert R. Miller, Wallace Myers Jr., Stephen Olzinski, Joseph Pajuf, John Parsons, Eric Pfeiffer, James Rennebaum, David Spence, Ron Thur, Alan Weeks, and Robert A. Williams. 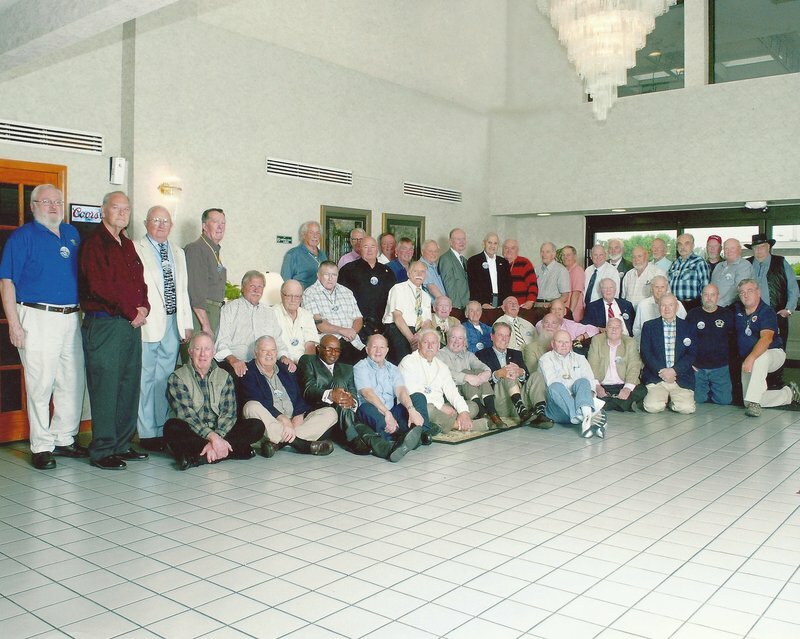 The 25th annual reunion of the USS Steinaker crew commenced on April 20, 2017 in Nashville, TN. This drive proved to be even further than our drive last year to Newfoundland! In spite of our exhaustion, all hands enjoyed a cocktail party sponsored by Sally Cascini in honor of our dear departed shipmate Frank Cascini. This provided an informal setting for us to catch up with news since our last get together. As with past reunions, there are always a number of faces new to us. I believe that our new attendees were well impressed. We all send our thanks and appreciation to Sally for this very generous donation. Friday morning 8 a.m. we all boarded a bus for a tour of Nashville and surrounding environs. Many of us had never been there before and this was quite exciting. There were a myriad of impressive buildings and parks. I don’t think I have seen so many music venues within such a small area! Alas! We were not able to jump off the bus and take advantage of any of them! Soon it was time for lunch and we boarded the General Jackson Showboat. A delicious buffet lunch was followed by a raucous and foot stomping show. Those not so interested in the show were able to sit outside and enjoy the sights along the river. By 3 p.m. we were all back at the hotel to get ready for the evening entertainment at the Grand Ole Opry. Before we left, we enjoyed another fine buffet meal at the hotel thanks to the generosity of Harry and Ruth Hodum. The Opry was quite the experience. A number of fine acts performed and the audience really seemed to get into the mood. The one mystery to me was the signs on either side of the stage that said...On Air. I couldn’t figure out why between the acts they were talking about used cars and other products. Someone finally enlightened me to the fact that on Friday evenings, the show is broadcast on the radio! Overall a well run and efficient venue which we all enjoyed. Thanks to Frank Furtado for covering the bus expenses for our group. The usual business meeting was held Saturday morning. Details are available in the official report on this website under the heading “Reunion News.” The afternoon was left to personal time and many decided to tour the local shopping opportunities. Dinner commenced at 6 p.m. and even though it was excellent, the action was all around the silent auction. Much more activity than in past years. A good sign. After dinner, Jim Bunch and I performed our usual shitck. No matter how bad we are, there always seem to be a great number of laughs. It feels so good when the audience is with you and at the same time generously contributing to our financial future. By the way, special thanks to Bill and Valerie Grason for sponsoring the Saturday night dinner in memory of Mary Lou Grason. By the time the evening ended, most were tired but more than happy with their new purchases! Sunday morning is always get ready to leave but before we said good-bye, Joe Tucker took some shipmates to McDonald’s behind the hotel. It was ostensibly to show us all how the new Apple watch worked when paying for coffee. Steve Jobs would be rolling over in his grave if he saw how many attempts it took to pay for 3 coffees with that watch! But while there, a funny thing happened. Jerry Blanchette struck up a conversation with the man providing the musical entertainment inside Mc Donald’s. What ensued was something to be remembered. At least at this point Tucker’s iphone was working properly so he was able to record the event. Click on the link below to see the entire episode. By now most had departed and the 25th Annual Reunion was relegated to history. See you all next year in Virginia Beach!